February 2018 Newsletter – Family Services, Inc.
Like many of us, I have a morning ritual. I wake up before my alarm clock rings (I’m not sure why I bother to set it each night, except for the fear of over sleeping, which I have not done in more than 20 years), I brush my teeth, I start the coffee, and I turn on the news. I listen to stories of natural disasters, murders, outbreaks of illness, corruption and tweets. I have decided to change my ritual. I worry that my cherished and cultivated optimistic world view is being altered by too much exposure to these kinds of events. In watching the news and scanning social media, I am becoming aware that my perception of the ratio of negativity to positivity in the world is being altered and I need to change that. I have decided to pass on the AM news and listen to Ted Talks with optimistic messages in the morning. I am doing this not only because I want to “feel” better, I actually want to “be” better. On March 27th, 2017 the New York Times published an article called “Look on the sunny side of life”. It reviewed studies that have shown an indisputable link between having a positive outlook and health benefits like lower blood pressure, less heart disease and healthier blood sugar levels. I want all that. I also want these benefits to last. I spend at least a third of my time working, so my positivity needs to extend past my morning ritual and carry throughout the workday. A positive attitude in the workplace has significant benefits as well. Barbara Fredrickson, University of North Carolina published a landmark paper about how positive thinking impacts our brains. Her findings suggest that positivity in the workplace enhances our ability to build skills, enhance productivity, improve outcomes, and develop resources that last a lifetime! Optimism influences how we approach our daily work lives and assists us in effectively meeting and mastering challenges in the workplace. 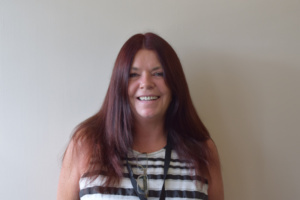 Family Services has long been committed to “Providing Hope, Improving Lives and Strengthening Community”. We approach our work from a strength based perspective, a way of viewing people as resourceful and resilient. This focus helps to create a positive mindset that builds on peoples best qualities, helps find strengths, and assists in building a worldview that is more positive. I encourage all of you to think about ways in which you can bring more positivity, hopefulness and optimism into your lives and your workplaces. Thank you to all who came out to support Family Services at the Report to the Community Luncheon on Thursday, February 1st at the Poughkeepsie Grand Hotel. 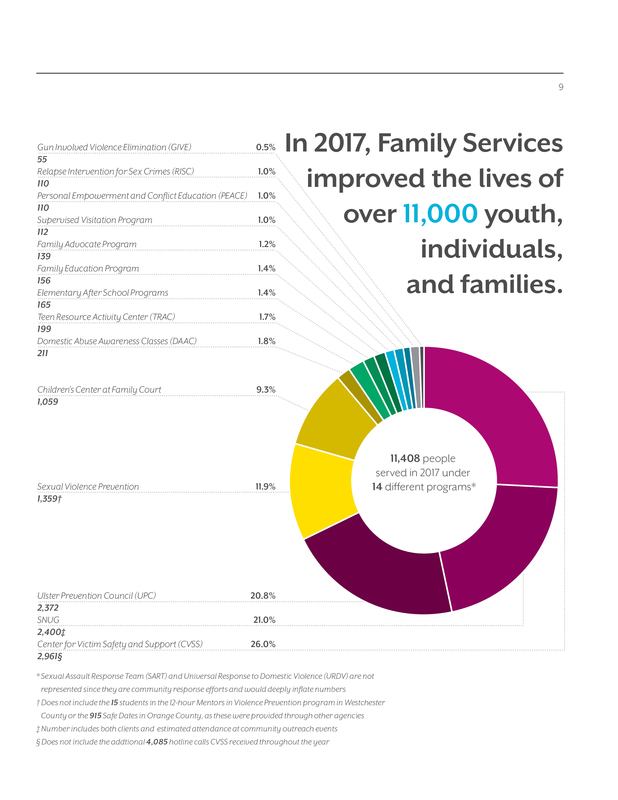 Brian Doyle, CEO of Family Services, discussed our outstanding accomplishments of 2017 and what plans are in store for us in 2018. Dr. Stephen Bavolek, recognized leader in the fields of child abuse and neglect treatment and prevention as well as parenting education, was the keynote speaker. 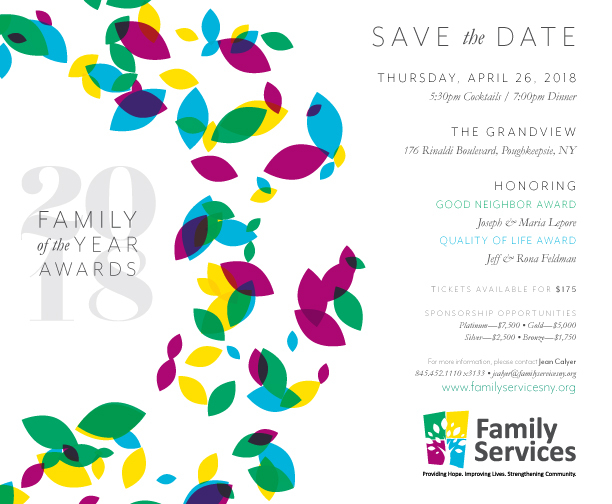 Special thanks to our sponsors: HealthQuest, iHeartMedia of the Hudson Valley, Dutchess County Community & Family Services, Breaking the Cycle, Astor Services for Children and Families, Children’s Home of Poughkeepsie, and The Center for the Prevention of Child Abuse. Top Left to Right: Dr. Stephen Bavolek, Kerry Eaton, Health Quest Chief Operating Officer, Congressman Sean Patrick Maloney. 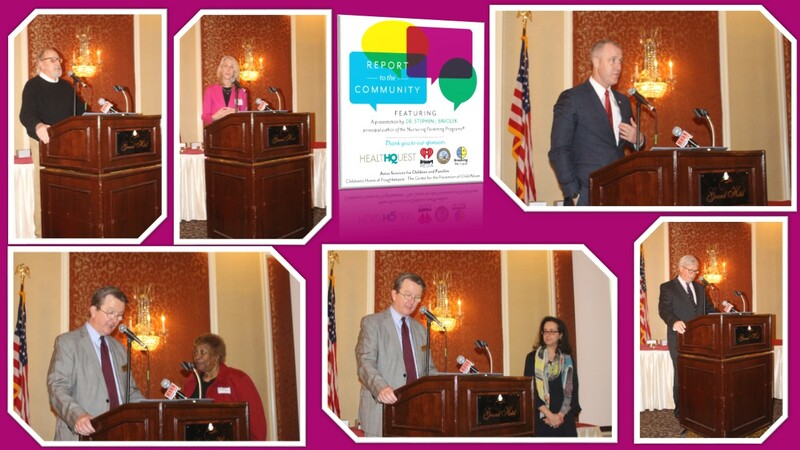 Bottom Left to Right: Brian Doyle, Family Services CEO & Barbara Jeter-Jackson, Dutchess County Legislator, Brian Doyle, Family Services CEO & Sabrina Jaar Marzouka, Commissioner of Dutchess County Department of Community and Family Services, Richard Mitchell, Esq., Family Services Board Chair. 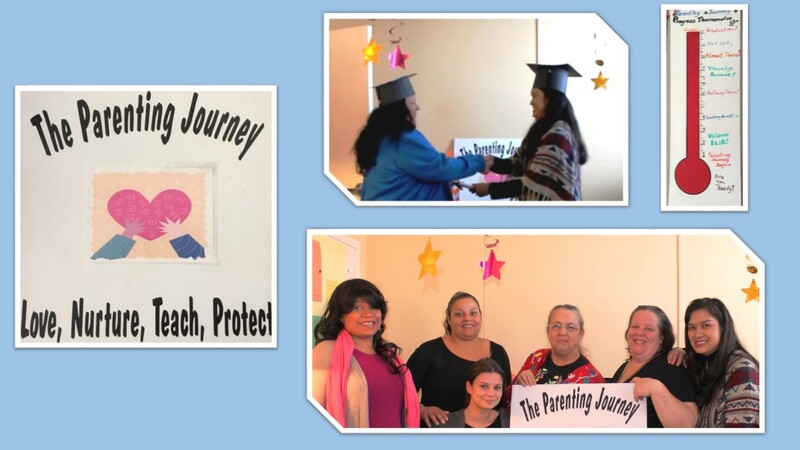 The Family Services’ Family Education Program held a graduation for its participants in the Parenting Journey group on December 13th. Parenting Journey is an opportunity for parents to be nurtured and to develop as nurturing people, capable of making responsible and informed choices in rearing their children.The FEP team and program participants were joined by guests and the NEXIS team from Ulster County Department of Social Services (UCDSS). Participants lit a unity candle and walked down the hallway for the graduation march with their graduation caps. 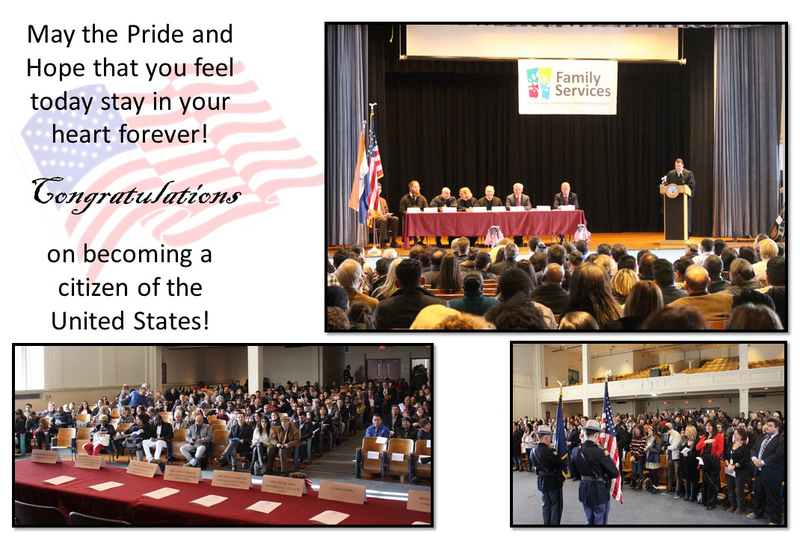 On Friday, February 2nd, the Family Partnership Center hosted a Naturalization Ceremony where 145 people from 56 different countries were sworn in as US Citizens. The auditorium was filled with family, friends, and members of our community and government to congratulate and celebrate them. 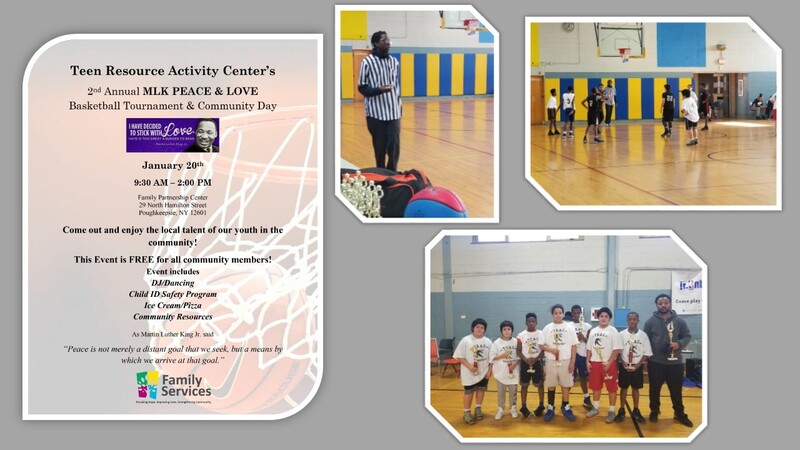 On January 20th, Family Services’ Teen Resource Activity Center (TRAC) held its second annual MLK Peace & Love Basketball Tournament and Community Day. 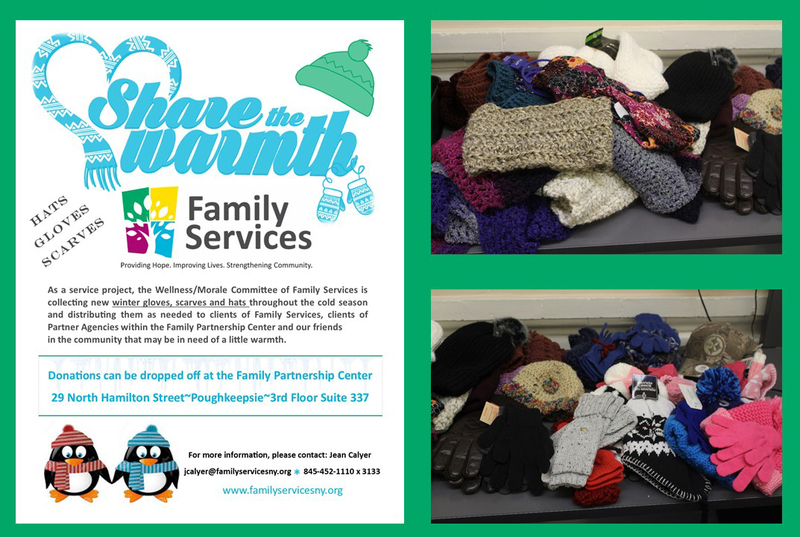 The event took place in the Family Partnership Center Gymnasium and Cafeteria. During this event, children and families enjoyed basketball and music by a DJ, participated in the Child ID Safety Program, ate pizza and ice cream, and had access to multiple community resource tables. Martin Luther King Jr. said, “Peace is not merely a distant goal we seek, but a means by which we arrive at that goal.” “The MLK Peace & Love Tournament brings our community together for an event the whole family will enjoy and supports the great talent of our city youth” said Jessica Wallach, Youth Services Coordinator.